One of New York City's greatest achievements is a subway system that runs throughout the city 24 hours a day. Queens is fortunate to have a number of lines that run through it, from the "International Express" that is the 7 train, to the only train that doesn't enter Manhattan, the G.
Trains are fairly clean and graffiti is not much of an issue anymore (scratchiti is, though), and a few homeless New Yorkers still use the subway as their temporary residence. Newer trains populate almost all lines in Queens, except for the 7 and the R (sometimes). These newer trains have digital readouts marking the stations on the line, bench seats, and a pre-recorded announcement of each station that is clear and easy to understand. The Metrocard is the primary way to pay for a fare these days, too. Tokens are no longer accepted. Stations include Queensboro Plaza, 39th Ave, 36th Ave, Broadway, 30th Ave, Astoria Blvd, Ditmars Blvd. The N/Q is elevated through Astoria. Queensboro Plaza, Astoria Blvd, and Ditmars are express stops. Stations include Queens Plaza, 36th St, Steinway, 46th St. The R is underground in Astoria. Queens Plaza is an express stop. 23rd St/Ely, Queens Plaza, 36th St, Steinway, 46th St. The E/M is underground in Astoria. Queens Plaza and 23rd Street are express stops. Vernon/Jackson, Hunters Point, Court Square, Queensboro Plaza. 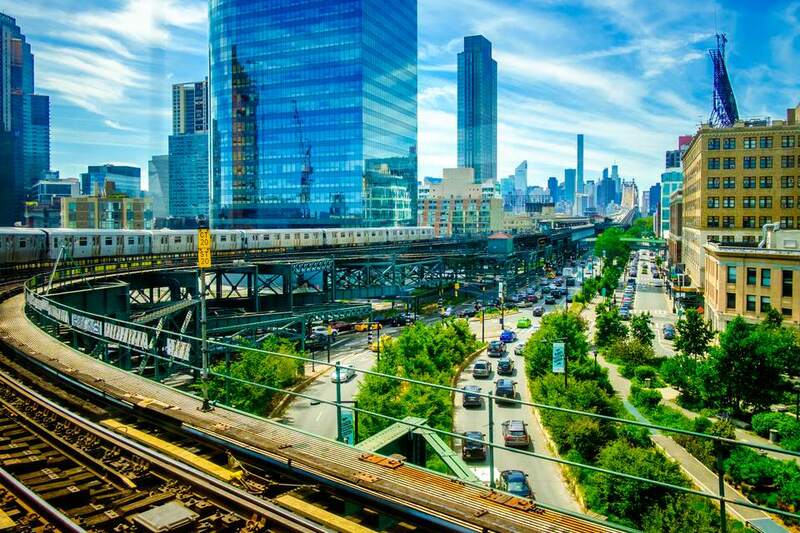 The 7 is both underground and elevated in Long Island City. All LIC stops are express stops. The F is underground in Astoria. The 21st Street stop is an express stop and is also an accessible station. The G is underground in Astoria. All stops are express stops. You can also "transfer" between Queensboro Plaza and Queens Plaza by exiting the system, walking a few blocks, and re-entering the system. This requires paying two fares if you use anything other than an unlimited Metrocard, but it might be more convenient for some than going into the city and coming back again. Additional useful transfers include catching the M60 bus at Astoria Blvd to get to LaGuardia Airport or Harlem. You can also catch the LIRR at Hunters Point (very limited hours). Part of living with a 24-hour subway system is that there is no natural downtime when work and upkeep can be performed on the lines. So, service changes are scheduled ahead of time. Service changes can take a number of forms: a shuttle bus will replace part of a line, stops are skipped, or trains will travel on a line that is not their own (this happens to the R more than the other lines). You can find announcements of service changes on the MTA's Service Advisory page as well as on the Straphangers site. You can also receive service changes and alerts via text message or email with the MTA Email and Text Message Alert System. By creating an account, you'll be able to set up email and text messages from the MTA about service advisories and alerts. You can even suspend notifications while you're on vacation and re-activate them when you return. This is a very handy service. Also, planned service changes are displayed at the affected subway station. Be aware that sometimes there is no time to create an announcement of a service change, and that is always a surprise. The most common surprise service change is when the N/Q train goes express between Queensboro Plaza and Ditmars Blvd. Usually, this happens when trains are slow and get backed up during rush hour. It is very helpful to see a map of the system you're trying to navigate. Google Maps has a lot of transit information available on their maps, and of course, the MTA has its own subway map online. And while you can figure out a lot by simply looking at a map, sometimes you need a little help with directions. That's where Google Transit and Hop Stop come in. Both can provide you with door to door travel instructions, and are also accessible on your mobile phone. The Ditmars Blvd stop is one of the best, and you are fortunate if it is your stop. It is both an express stop and it's at the end of the line, which means if the train goes express suddenly, your stop will not be missed. Also, in harsh hot and cold weather, you get to wait in a comfortable climate instead of freezing or melting outside. Additionally, you'll almost always get a seat during morning rush hour, since it's the first stop. Queensboro and Queens Plaza are also safe if the train suddenly goes express, as they are both major transit hubs and all trains stop there, express or not. Living near Broadway and 34th gives you access to both N/Q and E/M/R lines. In the winter, especially on the elevated lines, the stairs can become particularly treacherous and icy. Employees are supposed to salt the stairs, but that doesn't always happen, or it sometimes happens haphazardly. So be careful out there.